1. Sautée 3 eggplant slices in coconut oil on skillet until lightly brown. 2. To make salsa, blend the salsa verde ingredients. 3. Now mix chicken with salsa verde to coat. 4. 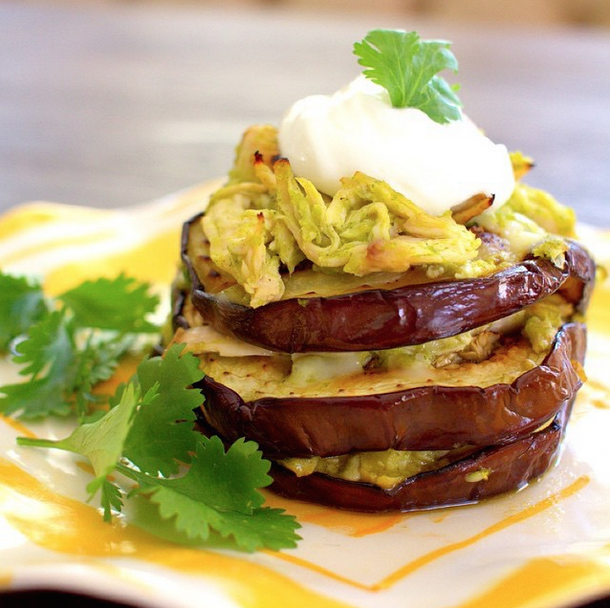 Set your oven to 375F and later eggplant and chicken dollops until you have a nice tower. Bake for 15 min. 5. Take out and put Greek yogurt on top! 225 cals, 4g fat, 19g carbs, 30g protein.